Friday, February 1, 2019, 9:30 a.m. and 11:30 a.m. TICKET PRICES : $7 per person. If you need to invoice, call the Box Office at 408-961-5858, Monday-Friday, 10am-4pm. Jean-Michel and the Be-Bop Kings aims to introduce young audiences to the legacies of groundbreaking musicians through the captivating work of Jean-Michel Basquiat. This performance explores what these artists shared in common and how their respective life experiences and the social conditions they navigated shaped their worldview, informed their artistic sensibilities, and inspired prolific creative output. 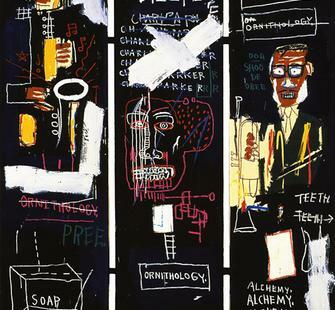 Jean-Michel Basquiat (1960-1988) ranks among the most compelling painters of the 20th century. He possessed a deep love and passion for jazz, particularly the be-bop style, and found great inspiration in the creative achievements of the genre’s great masters—legends like Charlie Parker, Miles Davis, Max Roach, Dizzy Gillespie and others—often paying homage by depicting them in his paintings as noblemen, kings, and heroes. Basquiat’s work possesses visceral intensity, humor, spontaneity, fire, and grit, not unlike the musical compositions of the architects of modern jazz he so admired.